We each need a good food buddy or two. Mine is a petite Filipina who can eat anyone under the table. Cindy modestly claims it’s all about the pacing, but those of us who’ve had the pleasure of dining with her know that it’s really 1) her absolute love of anything sweet, sour, spicy or savory, and 2) a secret second stomach. So, yesterday, when I found her picnic spot in Golden Gate Park, I wasn’t surprised to see that more blankets were dedicated to the spread of food than to her widening circle of guests. It was like a sprawling landscape of culinary discoveries. Others are content with plastic containers of potato salad or some Italian sausages or maybe a hamburger patty or two. Not Cindy. She was already passing around plates of steak with chimichurri sauce, paper thin slices of headcheese, and expertly tied bacon bites. The best things about a true food buddy is an openness to tasting anything and the gusto of enjoying everything. Whether it’s her own cupcakes with chocolate ganache or Nutter Butters topped with June Taylor plum conserve, she relishes all food to the very last plate-scrape and finger-lick. We ate nonstop for 5 hours. These are simple to make yet very, very good. Bring bacon bites for your next potluck picnic and see how many new friends you make. 1. Trim off the stem tips of fresh figs and slice nectarines into thick wedges. Cut each strip of bacon lengthwise into two thinner strips. 2. Wrap each piece of fruit carefully with a ribbon of fatty goodnes. 3. Sear the bacon bites at the edge of the grill, where it’s not quite so hot, or wait until the coals are dying down at the end of the picnic. 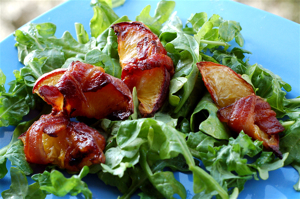 Serve over baby arugula leaves as a salad or nibble as is, hot and glistening, for dessert. I think they would be lovely over vanilla or caramel ice cream.